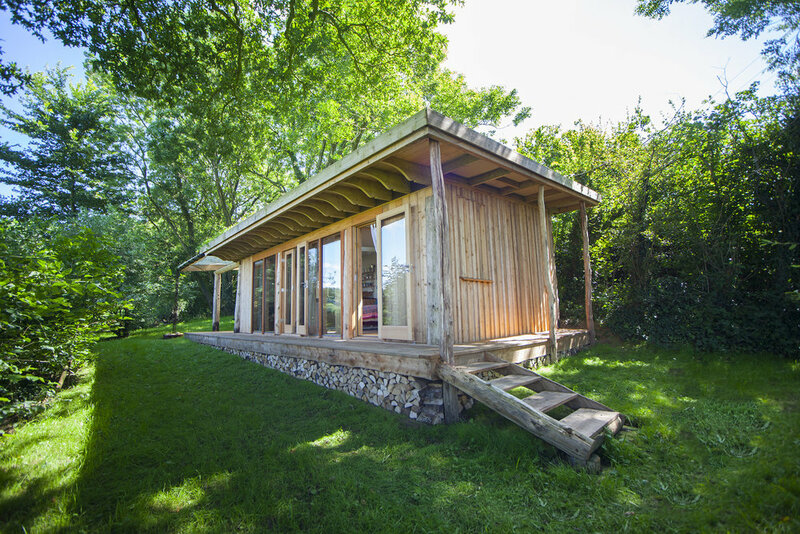 Jake’s Cabin is tucked away in one of the most magical secluded locations in Somerset. Waking to birdsong and with views of undulating meadows and hillside Jake’s Cabin provides closeness to nature that melts away the strains of busy lives. This beautifully crafted retreat can be found in a sunny clearing, hidden from view and protected from the elements by the old oak and hazelnut trees that cast dappled sunlight over its living roof. 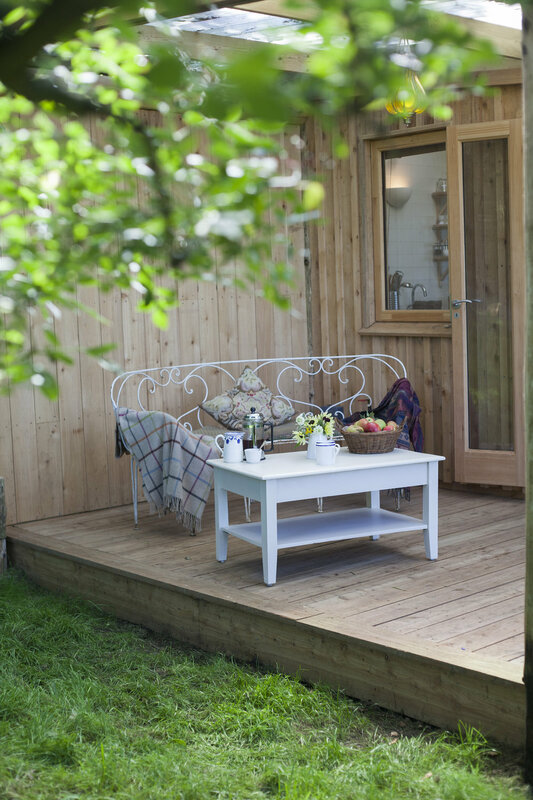 Built from local cedar and larch and using only eco friendly and re-cycled materials, this resting place has been built for comfort, warmth and light and to bring joy and relaxation to all who come to stay! Based on our much-loved Gabriel’s Wagon, Jake’s Cabin has more space and an internal door leading to the bathroom that hosts a warm yellow roll top bath with an external door for a bath with a view; It has a luxuriously comfy day-bed with a v sprung mattress and silky soft bamboo bed linen; floor to ceiling windows running along its length and sky lights, so that whether from the bath, bed or from the soft sinking cushions of the old Ercol sofa, you can enjoy the views, catch the sunlight and watch the stars..
Jake’s Cabin has running hot and cold water and electricity and is properly equipped with kitchen utensils, cutlery, crockery, a baby belling hob and oven, Belfast sink and fridge. 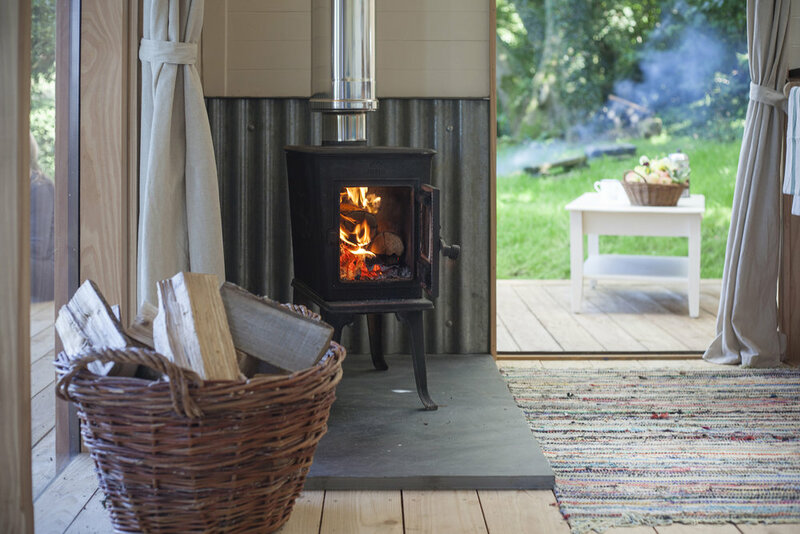 The wood-burning stove keeps the cabin in constant warmth, thanks also to its high spec draft proof insulation. The verandah offers a covered area to sit on the beautiful French wrought iron bench for outdoor breakfasts and suppers and to just enjoy the view or the fire-pit and fire wok for outdoor cooking. If you wish for a high look out, or to just sit amongst the tree canopy, at your own risk (!) you can use the ladder to enjoy the living roof of 98% woodland flowers, planted to blur the boundaries of this little cabin with its surroundings and to help whoever is staying to connect with the landscape too. Even in rain there is something to enjoy watching as the rainwater runs off the woodland roof and down a chain into a water bowl creating a beautiful natural water feature.